‘We’re having difficulty containing our excitement for the start of the NFL season. 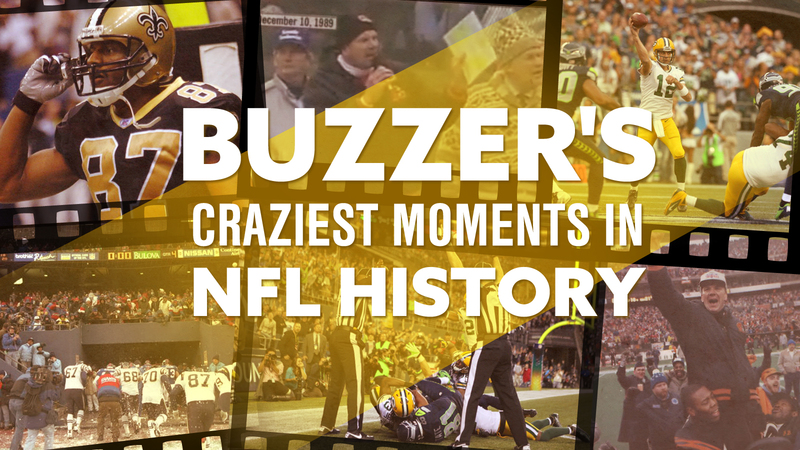 In an effort to cope with that delirium, the Buzzer will post one crazy moment in NFL history every day from now until the Sept. 4 kickoff. "Crazy" is subjective, so what does that mean here? In this series we won’t be highlighting the most outstanding plays or statistical feats — but those plays that make your jaw drop and cause you to blurt out, "holy $*%", that was crazy!" Saints radio play-by-play announcer Jim Henderson’s call is priceless. "Noooo! He missed the extra point, wide right!" Henderson bellowed after John Carney’s kick. "Oh my God, how could he do that?" Turns out the Saints would have been eliminated from playoffs contention even if they had won in overtime, so the game still would have ended in heartbreak — albeit more bittersweet than gut-wrenching.